I have been out of commission for a bit. Summertime is crazy with trips and navigating kids' schedules plus the last two weeks I had to work more than usual at my out of the house job! On top of that, I am going to be moving my blog to Word Press and that has required a significant amount of behind the scenes work. Blech. So tonight, instead of being productive I have been dreaming of my next trip to Walt Disney World (whenever that might be!) 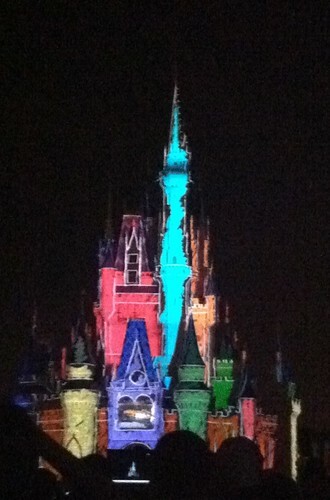 I took this picture on our last trip during the Magic Memories and You show on the castle. I was skeptical but it is extremely creative and cool. This Cinderella's Castle picture also made me miss my last visit to Disneyland. I hope I can schedule another trip there soon. Winnie the Pooh and Harry Potter?